Bolt faces Tesla challenge: With the all-electric 238-mile range Chevy Bolt beginning production next month for scheduled dealer deliveries starting in late 2016, the question of General Motors’ advantage over Tesla Motors keeps coming up. While it could be a full year before the Tesla Model 3 starts being delivered to buyers, Tesla may still have an edge. Automotive News used the example of the Soviet Union beating the U.S. in the space race by a full year. GM has more than enough room in plant production and a large dealer network for sales and service. One distinct difference is Tesla’s passionate fans, of which more than 300,000 have put down deposits on the Model 3. The Chevy Volt plug-in hybrid has a large group of loyal followers, but the all-electric Bolt will be a brand new front for GM to enter on a large production level. “It’s (the Bolt) from an automaker that has a dealer network and can assure support for it. But the Bolt doesn’t have the excitement around it that the Tesla Model 3 does,” said Jake Fisher, director of auto testing at Consumer Reports. U.S. and China far from fossil-free: While the U.S. and China made admirable agreements in 2014 on jointly reducing greenhouse gas emissions, a recent report points in the other direction. The U.S. and Chinese governments released reports at the meeting of G20 nations in Hangzhou, China, earlier this month. Both countries are still heavily subsidizing the fossil-fuel industry. These subsidies come through various channels including refining and processing oil, transporting coal, power and heat generation, and fuel-tax concessions. According to the studies, the U.S. gives out about $8.1 billion annually in subsidies and China around $14.5 billion; though it may be higher with China not reporting some of the data. LG Chem working with Faraday: LG Chem will be the provider of lithium cells to Faraday Future in a $2.4 billion supply deal, according to the Korean Herald. The story mentions parent company LeEco’s LeSee super electric car getting lithium cells for battery packs, but the Faraday FFZero1 will also likely receive the technology. The LeSee and FFZero1 have been heralded by Chinese tech and media giant LeEco as being strong competitors to Tesla, starting in China and the U.S.
Tesla trusted brand: Tesla was ranked the most trusted auto brand in Canada despite its low sales; at number 11 on the list, it was in front of all other auto brands sold in Canada. It had to do with how the company, “respects the environment, treats employees well, invests in the community and cares about societal well-being,” said Saul Klein, dean of the Gustavson School of Business. Survey respondents under 35 gravitated more toward Tesla, having been influenced by Tesla’s commitment to a fossil-fuel-free automotive future. The data was collected between June 20 and July 8 of this year, so the June 30 reporting of the fatal crash in Florida involving Autopilot likely had little effect on the survey findings. Self-driving car crash: A Google self-driving test car took its worst crash ever after being side swiped in an intersection in Mountain View, Calif., on Friday. There were no injuries. Google stated that the traffic signal light was green for at least six seconds before the self-driving Lexus SUV entered the intersection. An Interstate Batteries van ran the red light and hit the test vehicle. In February, a Google test car caused a low impact crash with a bus, but all the other crashes have been caused by a human driver. GM switching Volt name in China: If you’re planning on buying a Chevy Volt in China, search for a Buick Velite. General Motors hasn’t verified it yet, but a photo was reportedly taken at China’s agency that approves new vehicles before being sold, the Ministry of Cars, that makes the case. The Buick brand is more prestigious in China than Chevrolet and sells in higher volume, according to Chinese website Autohome. Estimated range on the battery is 62 miles, a bit higher than the 53 miles in the U.S. EPA rating. NGVs contributing to 54.5 mpg mandate: Natural gas fueling station developer VNG presented a four-point statement to the government agencies receiving feedback on the mid-term evaluation of the 54.5 mpg by 2025 mandate. Gasoline-engine vehicles are getting more efficient and electric vehicles longer range, but natural gas has been omitted from the process so far, VNG said. NGVs are a proven low-emission alternative for pickups and there isn’t much out there in plug-in pickups on the market. Renewable natural gas (RNG) captured from landfills, dairy farms, and wastewater plants has gone from a niche fuel to providing over 35% of NGV fueling nationally and over 60% of NGV fueling in California, according to VNG. There are many synergies between the development of the NGV market and the nascent market for hydrogen fuel cell vehicles, and the infrastructure is mostly in place already for NGVs that can be applied to hydrogen. The fourth argument speaks to turning used vehicles into assets by retrofitting them to CNG; it takes old, polluting gasoline and diesel engine vehicles off the roads and turns them into clean CNG-powered vehicles. Propane a strong performer: In a recent U.S. Environmental Protection Agency emissions test, the Ford Transit showed dramatic reductions of harmful emissions while performing on propane autogas when compared to the same engine operating on gasoline, according to Alliance AutoGas. The EPA certification process is required for any alternative fuel vehicle system operating in the U.S. (and many times, a California Air Resources Board certification applies). EPA testing has found a few clean benefits of propane autogas, including reducing carbon monoxide (CO) by 79.45%; reducing carbon dioxide (CO₂) by 22.39%; reducing nitrogen oxide (NOₓ) by 42.31%; and reducing non-methane hydrocarbons (NMHC) by 53.97%. Energy policies after the election: A former acting head of the U.S. Environmental Protection Agency said that natural gas and renewable energy are likely to endure no matter who gets elected president. “First, the price of natural gas is not going to go up under any administration, and it will continue to displace coal generation in the United States,” Bob Perciasepe, the former acting administrator, said at the Society of Environmental Journalists conference in Sacramento. “That trend will continue no matter who is president, and that downward trend or pressure on emissions from the power sector [also] will continue” unabated, he said. As for renewable energy such as solar and wind, Congress has locked in production and investment tax credits for the next four-to-six years; unless Washington overturns the decision, which is unlikely, said Perciasepe, now president of the Center for Climate & Energy Solutions. A lot has changed in the global auto market over the past year, since the Volkswagen “dirty diesel” scandal broke. The Paris Motor Show used to be a platform for French and German automakers to show off their latest high-performance diesel cars. That’s been backtracked in the wake of the VW diesel recall and litigation, and with pressure being put on European regulators to crack down on carmakers for diesel emissions. Electric cars are expected to play a larger role in the European market in the years ahead. German automakers are feeling pressure from the attention and sales gained by Tesla Motors in the luxury electric car space in Europe, North America, and China. Stars of the Paris auto show for a few automakers will be their latest electric vehicle technologies. Mercedes-Benz will unveil the first electric car from its new lineup of Tesla-fighting models. VW’s Porsche brand will unveil its Panamera plug-in hybrid electric vehicle. The large luxury hatchback will have a range of 31 miles and top battery-powered speed of 86 mph. VW has had to tighten its budget to recover from the diesel scandal, and to pay for all the settlements and recalls. Earlier this month, Hinrich Woebcken, the head of VW’s North American operations, said that the automaker has decided to end all U.S. diesel sales. As for the Paris Motor Show, VW decided to not demonstrate its Bentley and Lamborghini supercar brands this year to cut back on costs after being hit hard by the emissions scandal. Electrifying product launches: There will be a few more electric car announcements expected to be made in Paris. Mercedes-Benz will be showing off an all-electric SUV at the event. Mercedes does have six new electric models in the pipeline scheduled to be released between 2018 and 2024, though they won’t be badged separately, as BMW chose to do with the i-Series electric cars. M-B’s new electric cars are expected to be visibly distinct with a striking design and nomenclature, according to Automobilwoche, a sibling publication of Automotive News. BMW is expected to show an i8 Spyder plug-in hybrid. It will share the stage in Paris with a revised i8 coupe that’s also being unveiled. 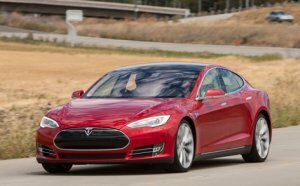 Both will share a longer-range battery and more powerful electric motor, Automotive News reported. French automaker Citroen is showing the plug-in hybrid Cxperience concept car. It’s a low-the-ground sedan with rear suicide doors and a short rear deck. Mitsubishi will introduce a few hybrid and all-electric vehicles, including a plug-in hybrid SUV concept vehicle. The GT-PHEV SUV has been designed around the automaker’s next-generation plug-in hybrid system. The system uses three electric motors and an internal combustion engine designed specifically for hybrid applications. General Motors’ Opel division will be unveiling the Ampera-e, the European version of the Chevy Bolt. Opel says it will cost less than a Tesla and will go 250 miles on a charge, using European standards longer than U.S. range. Toyota will show the Prius Prime again after being revealed at the New York auto show. As for showing a prototype, the Toyota FCV Plus will be displayed again (after being introduced at the Tokyo motor show last year). The fuel cell vehicle can be used as a generator to make electricity for a home. The Smart ForTwo has a next-generation platform that will be extended over to the Cabrio and Smart ForFour models for a 2017 launch. Smart says it will be the only automaker to offer its entire lineup with both gasoline engines and all-electric versions. The Smart electric cars will compete with the Renault Zoe and Volkswagen e-Up. Smart says its electric cars will go 100 miles on a charge, and take around 45 minutes to recharge from a fast charger. Ferrari will show the LaFerrari Aperta, which is an open-top version of the $1.1 million, limited-edition LaFerrari hybrid. The Italian sports carmaker Ferrari is also unveiling a fuel-efficient twin-turbocharged V-8 engine GTC4Lusso variant. It’s part of the Italian automaker’s strategy to meet government pressure in fuel economy improvements, according to Automotive News. Automakers starting to skip out of auto shows: In a surprising move, several automakers decided for the first time to skip the Paris Motor Show. Ford, Mazda, Volvo, Rolls-Royce and more (including, as previously mentioned, Bentley and Lamborghini) won’t be attending and displaying cars. That’s bad news for others cities with large auto shows, especially Detroit, Los Angeles, New York, Geneva, and Frankfurt. While these auto shows have been known to draw millions of visitors, along with executives and journalists, automakers are finding new channels to launch new vehicles. Feds issue self-driving car guidelines: Long-awaited federal guidelines have been issued on self-driving cars. Late yesterday, Anthony Foxx, secretary of the U.S. Department of Transportation and Jeffrey Zients, director of the National Economic Council, released guidelines that encourage technology innovations from automakers and suppliers balanced with concerns over public safety. The DOT does recommend having uniform national standards for autonomous vehicles, and states will be included in the process. Several states have been years ahead of the federal government on issuing testing standards. That was part of the DOT’s 15-point safety standard for the design and development of autonomous vehicles. The agency also clarified how current regulations can be applied to self-driving cars, and other contested issues. The federal government is encouraging innovators like Tesla, Google, Apple, Ford, Intel, and others, to continue testing and developing autonomous technologies. Tesla’s fatalities in incidents where the Autopilot semiautonomous systems was involved will be closely scrutinized, along with these new federal guidelines, as the nascent technology moves forward. Details released on Chevy Bolt: Pricing of the all-electric Chevy Bolt starts at $37,495 for the LT trim, with the higher-end Premier trim starting at $40,905. With the federal tax credit, purchasing a Bolt when it rolls out late this year will start at $29,995 for the starting price. 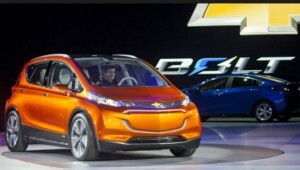 Last week, General Motors announced the Bolt will be able to travel 238 miles on a single charge through its 60 kWh battery. For those willing to pay for the Premium level, the Bolt will receive a 360-degree camera system, leather seats, blind spot monitoring and rear cross traffic alert, and options for forward collision alert, lane departure warning, and several other features. Clean Technology Forum: Sacramento Clean Cities Coalition is hosting its annual fall conference, the Northern California Clean Technology Forum, Oct. 19-20, at the California Automobile Museum in Sacramento. The event brings together regional and national fleet managers and industry stakeholders to explore available technology and vehicle options, as well as looking at policies, incentives, and regulations helping to move the market. CALSTART Senior Vice President Bill Van Amburg will speak on the state of the clean commercial vehicle industry, funding and incentives, future technologies and issues, and vehicle electrification. Another featured speaker will be Bill Griffiths from Montgomery County, Maryland; he was a 2015 fleet manager of the year award winner. This year’s awards will be presented on the opening night reception on Oct. 19 to five award categories: Public Fleet, Private Fleet, Individual, Lifetime Achievement “Career,” and Lifetime Achievement “Superior Accomplishment.” The conference also includes a medium-and heavy-duty Ride & Drive. There is no charge for these activities. You can register here. Autonomous vehicles fast approaching, Lyft exec says: Self-driving cars will show up in real numbers five years from now, and ride-hailing firms will take the lead. That’s according to an exclusive Time interview with John Zimmer, Lyft’s cofounder and president. He doesn’t see consumers trading their cars for self-driving cars as much as consumers paying for trips in self-driving cars that they don’t own. Car ownership will “all but end” in major U.S. cities within 10 years, according to Zimmer. Zimmer’s interview was published days after Uber began adding riders to its self-driving vehicle test runs in Philadelphia, the first time this experience has been made available to the general public. Tesla makes energy deal with SCE: Tesla Energy will supply 20 megawatts of energy storage to Southern California Edison – enough to power about 2,500 homes for a full day, according to Tesla. The Tesla Energy batteries will make up the biggest lithium-ion battery project in the world in total megawatt hours, according to Bloomberg New Energy Finance. The deal with SCE comes from the utility’s efforts to prevent blackouts by fossil-fuel electricity generation with lithium-ion batteries. BYD expanding California plant: Chinese automaker BYD said that it’s launched the second of three expansion phases at its manufacturing plant in Lancaster, Calif., which will add an additional 40,000 square feet added to the existing facility. The company currently employs about 400 people working at the plant, with plans to triple employment. That’s coming from increased demand for its electric coaches and buses, along with new medium- and heavy-duty trucks. When asked if BYD plans to produce light vehicles in the U.S. (such as popular electric car models sold in China), a company spokesman declined to comment. Auto suppliers bullish on 2025 targets: Calstart recently conducted a survey of 23 suppliers selling parts directly to automakers. Seventy percent of the companies surveyed think that the U.S. shouldn’t back away from its 2025 fuel economy and emissions goal, according to John Boesel, president of Calstart. Fifty-nine percent said the target is creating job growth, according to the study. NGV sales forecast: According to Navigant Research, global annual natural gas vehicle sales are expected to grow from 2.4 million vehicles in 2015 to 3.9 million in 2025. Nearly 40 million light duty NGVs are expected to be on roads around the world by 2025. Several regions of the world have substantial markets for natural gas vehicles that are expected to continue growing over the next decade, but at a slower pace than what was projected prior to the drop in petroleum prices. Additional issues could hinder growth prospects, including ongoing political tensions in Eastern Europe that could affect supply and the prices of gas exports from Russia to Western Europe. Another trend to follow will be battery suppliers making major gains in battery cost reduction and capacity; making EVs more competitive compared to NGVs. Uber in Detroit: Uber will be adding Detroit to its office locations, to work with automakers and top suppliers. At an event hosted today by Society of Automotive Engineers in the Detroit area, Uber’s vice president of global vehicle programs Sherif Marakby announced that the company is planning on opening a facility in the Detroit area. The news follows Uber’s launch of a self-driving car test project in Pittsburgh last week that makes rides available to the general public. Uber will be looking for Tier 1 suppliers to design its hardware, he said. He also mentioned that Uber will be looking to work with automakers in that area to develop and modify its autonomous fleet. AltCar Expo coming up: The City of Santa Monica will present the 11th annual AltCar Expo on Sept. 16-17, dedicated to alternative fuel vehicles and alternative modes of transportation. On Friday, Sept. 16, Green Auto Market Editor Jon LeSage will be part of a panel on the Future of Mobility. Moderated by Hilary Norton, CEO of FAST, the lively panel will also include Michael Brylawski, CEO of Evercar; Delilah Lanoix, Co-Founder of ButterFli; Francie Stefan, City of Santa Monica’s Mobility Planning Manager; and Kat Urquhart, LEV Policy Consultant. On Saturday, Sept. 17, AltCar will be celebrating the 10th Anniversary of “Who Killed the Electric Car?” with a special screening and panel discussion with Chris Paine, Dean Devlin, and special guests. Paine will present journalist Dan Neil with the 1st Annual AltCar Disrupter Award. The two-day event will be held at the Santa Monica Civic parking lot and East Wing, 1855 Main St., Santa Monica, CA, from 10:00 a.m. to 5:00 p.m. each day, and is free to the public. It’s a great opportunity to check out and drive the latest in clean vehicles, including trucks being used by fleets. Apple downsizing: Apple has been cutting back on its investment in autonomous, electric vehicles; it may become more of a tech supplier than an automaker. Apple has laid off dozens of employees and closed off parts of its Titan project, sources told the New York Times. In July, the company handed over leadership of the project to Bob Mansfield, a prominent Apple veteran who had left the company’s executive team in 2013. He was asked to come back following a phase of fast growth and problems for the project. During the latest round, Apple employees were told that the layoffs were part of a “reboot” of the car project. Autonomous vehicle testing is continuing on closed tracks, sources said. Autopilot upgrade: While launch of the Autopilot upgrade was a week overdue, Tesla did put out Version 8 over the weekend. CEO Elon Musk told reporters during a conference call on Sunday that the upgrade likely would have prevented the May fatality in Florida attributed to the Autopilot system. A Tesla blog post described how the Autopilot upgrade will be able to tap into its radar, rather than cameras, to improve accuracy and rapidly respond to hazards through more advanced signal processing from the radar. BMW strategy: Pre-orders of the Tesla Model 3 has caused BMW’s management board to hold a strategic meeting in lieu of attending the Paris Motor Show. German rivals Daimler and Volkswagen have also pressed the issue with aggressive electrification campaigns; the VW emissions scandal and advancements in electric car batteries have had their influence as well. BMW has had internal debate over whether to accelerate development of new electric cars, given its expensive early investments into the technology and lackluster sales of the BMW i3, which had only 25,000 deliveries last year. Using RNG in transit: A webinar will be held on Sept. 21, at 11:00 a.m. PDT, for stakeholders in the transit industry on how near-zero emission engines using ultra-low-carbon renewable natural gas (RNG) can provide an affordable strategy to achieve major reductions in emissions of criteria pollutants, air toxins, and greenhouse gases from California’s transit sector. The Southern California Gas Company (SoCalGas) will be hosting the webinar on the California Air Resources Board’s new emission regulations for transit agencies called the Advanced Clean Transit Rule and how this engine-fuel combination offers the lowest overall emission profile among all commercially available advanced transit technologies. To register for the webinar and to read the full speaker bios, click here. Ford Smart Mobility: Ford has forged alliances with two mobility services through the acquisition of San Francisco-based shuttle service Chariot and a partnership with bike-share company Motivate. The deals were made under the recently formed Ford Smart Mobility Program, led by office furniture maker Steelcase’s former CEO Jim Hackett. Ford CEO Mark Fields has been talking regularly about the company’s mission to move beyond vehicle manufacturing and sales and over to mobility, electrification, and a self-driving car service. Details released on Revero: Karma Automotive released more information on the Revero plug-in hybrid. The price will be about $30,000 more than the Fisker Karma, starting at $130,000. It can go 50 miles on battery power, and can travel a total of about 300 miles on gasoline and battery power. A solar roof will provide some of the power used by the electric motor. Another new feature is that it will be DC fast-charging capable. Nissan Rogue: At the Miami Auto Show, Nissan launched a hybrid version of the refreshed 2017 Rogue crossover. It can go 33 mpg city, 35 highway, and 34 combined. It also comes in an all-wheel drive model, with slightly less lower mileage numbers. Climate change laws: California Gov. Jerry Brown has signed into law SB32 and AB197 which increases the climate change law to reducing emissions 40% below 1990 levels by 2030. David Reichmuth, senior engineer, clean vehicles at Union of Concerned Scientists, explored some of the issues that will affect clean transportation from the new laws. Read his article for the overview and a few interesting facts, such as: plug-in electric vehicle rebates will not be available for plug-in hybrids that have lower than 20 miles of range, and those households that make more than $300,000 per year will be ineligible ($150,000 for single filers). A123 and Argonne making long-range batteries: Lithium-ion battery maker A123 Systems made an agreement with Argonne National Laboratory – a cathode development program for making safe lithium-ion batteries with high energy densities and long lifetimes. A123 will take its experience and scientific talent to commercialize advances in nickel manganese cobalt oxide (NMC) technology originally developed by Argonne, the company said. A123 predicts the joint project will more than a 60% increase in energy density over its current products, with a corresponding increase in electric range for the vehicles it supplies. The Chinese government is taking punitive action on more than 25 vehicle manufacturers, from makers of passenger cars to buses, in a breaking scandal over subsidies granted for “new energy vehicles.” It’s one in a series of global scandals in the past year over false claims made by automakers related to regulatory compliance and subsidies for fuel economy, greenhouse gas emissions, and vehicle electrification. Five Chinese bus makers are being penalized by the government for taking about 1 billion yuan ($150 million) in illegal subsidies, including a division of popular Chinese carmaker Chery Holding. Nissan, Hyundai, Geely, Anhui Jianghuai Automobile (JAC Motor), a subsidiary of BYD, and other carmakers in China have been accused of violating funding program rules. One busmaker will have its production license revoked while other companies will be fined. 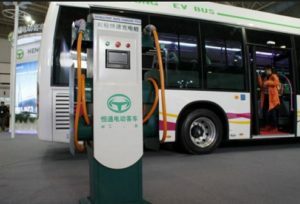 Government incentives helped Chinese sales of all-electric and plug-in hybrid passenger vehicles, trucks, and buses climb to 331,000 units last year. The China Association of Automobile Manufacturers revised its estimate for this year’s new energy vehicle orders to 400,000 from 700,000 vehicles on Friday, after the government announcements on automakers being penalized. On September 18, it will be one year since the Volkswagen diesel car emissions scandal blew up. On that day the U.S. Environmental Protection Agency issued a notice of violation of the Clean Air Act after finding VW intentionally programmed turbocharged direct injection (TDI) diesel engines to activate certain emissions controls only during laboratory emissions testing. Last week, a VW engineer became the first employee to be indicted and to plead guilty on criminal charges over the emissions cheating. VW engineer James Robert Liang pleaded guilty to a single charge of conspiracy to commit fraud against the U.S. government and VW customers, and for violating the Clean Air Act. The plea agreement also includes Liang being willing to cooperate with the U.S. government’s investigation into the diesel emissions fraud investigation. The conspiracy charge does indicate that other VW employees will face criminal charges by the U.S. government. This will take place during a vehicle recall process with government agencies in the U.S., Germany, South Korea, with other governments likely to follow a similar path. Other automakers face intense government scrutiny in regulatory compliance. Fiat Chrysler Automobiles is under investigation in Germany for false reporting on diesel emissions. Mitsubishi had its corporate offices raided by law enforcement in Japan last month over its mileage reporting scandal; that follows similar reporting scandals that enmeshed Hyundai, Kia, and Ford in 2013-2014. Will uniform global standards be adopted by government agencies and automakers measuring vehicle mileage and greenhouse gas emissions? Automakers are measuring miles per gallon differently than the EPA, though that may be changing toward more uniformity. The speed cars are driven at, the weight of the vehicle, external temperatures and conditions, and road incline grades, affect mileage, automakers say. But can they follow uniform guidelines that determine how all vehicle mileage ratings are determined? Diesel emissions measures can be manipulated by the testing methods being utilized. Electric car driving range on a single charge illustrates the distinctions in reporting standards that can throw off measurements. An all-electric car may get 300 miles of range by European NEDC estimates, but it would be a shorter range by EPA standards. The automaker will brag about 300-mile range, but won’t explain the distinctions unless it’s in small type in a footnote. How serious are automakers about reducing emissions? Global automakers are fearing their demise in a fast-changing industry. The Chinese auto market is becoming the most important one beyond the U.S. and Europe; and other markets like India, Brazil and Russia are growing. Growing vehicle classes are changing the game, from SUVs, crossovers, and luxury vehicles. New technologies like autonomous systems, infotainment connectivity, mobility services, and collision-avoidance systems are up there with vehicle electrification, and many times are much more important to automakers. What’s going to motivate them to invest in electrified and alternative fuel vehicles – and that includes manufacturing and marketing through dealer networks? Will they get away with it? VW is going to spend at least $20 billon in the U.S. alone in the government settlements and court cases. VW and many players in the game seem to think the German automaker will eventually absorb these losses and clean up its act. Some automakers won’t be able to make it through this type of crisis unless they merge with larger companies (like Mitsubishi is doing with Nissan). Automakers would to be wise to take honest emissions reporting, and spending of public subsidies, much more seriously. Consumer surveys, purchase trends, voting patterns, and opinions shared over the internet, indicate that more is being expected from automakers – from transparency and authenticity, adoption of advanced vehicles technologies, sustainable manufacturing, and compliance with emissions standards. Plug-in sales surge: Tesla led August U.S. plug-in sales performance in August, taking a third of the sales with the Model S and Model X. With about 3,200 units sold, the Model S doubled its sales over August 2015. The Chevrolet Volt had another good month, up over 50% in sales over last year while the Nissan Leaf continued its sales decline. Overall sales of all-electric and plug-in hybrid electric vehicles were up 66% over a year ago, according to HybridCar.com’s Dashboard. Hybrid sales were down 14.4% from last year, with the Ford Fusion Hybrid the only hybrid model in the top 10 seeing an increase over last year. Its hybrid sales were up 23% over a year ago, and the Fusion Energi plug-in hybrid sales were up 6% over the previous month and nearly 50% over August 2015. Google takes on Uber and Lyft: Google is testing out a carpooling service in San Francisco designed to compete directly with ridesharing services offered by Uber and Lyft. Since May, Google has been helping employees of major companies carpool to work with drivers sharing their cars with riders going to and from work. The carpool service uses the Waze navigation mobile app; Waze is a subsidiary of Google. Waze users share information with each other about traffic conditions, accidents, and police patrol cars. Riders are being charged at most 54 cents a mile, which is cheaper than Uber, Lyft, and taxi rides. Google and Waze started testing out carpooling last year in Israel, where Waze was founded. BYD performance: BYD reportedly sold 53,380 plug-in vehicles in the first half of this year, with Nissan coming in at second with 34,362 and Tesla following closely behind with 33,620. Chinese automaker BYD reported doubling its PEV sales in the first half of this year, and seeing profits going up 400% in the first half of this year compared to the same period the year before. There have been reports that the company is making plans to bring one or more models to the US market in the not too distant future. Daimler rolling out 6 to 9 new EV models: Daimler is said to be designing six, and as many as nine, electric cars to better compete in the luxury EV space with Tesla and Audi. A growing political backlash from the Volkswagen “dirty diesel” scandal has driven Daimler’s strategy, along with recent advancements in battery technology. 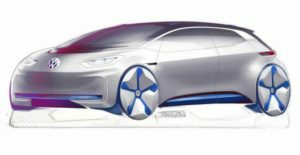 Daimler is scheduled to unveil a new electric car model at the Paris motor show in late September. Will it be an SUV or a sedan? California settlement: Volkswagen will pay $86 million to California in the diesel emissions scandal, which is where the largest share of the almost 600,000 cars on U.S. roads rigged to cheat tests were sold. The settlement will help pay for research grants, consumer protection programs, and the cost of the investigation by the California Attorney General’s office. The deal also prohibits VW and Porsche from advertising, selling, leasing or distributing in California any vehicles containing the so-called defeat devices used to cheat pollution tests. The automaker won final approval from the federal judge overseeing hundreds of lawsuits in the U.S.
Mitsubishi scandal widens: Mitsubishi’s headquarters and Nagoya plant were raided by government officials last week, further complicating the Japanese automaker’s attempts to resolve the mileage manipulation scandal that increased the number of vehicles involved by eight. Mitsubishi has said it used unapproved methods to calculate mileage for 25 years. “We want to thoroughly investigate the circumstances that led to this situation,” said Japan’s Transport Minister Keiichi Ishii. Tesla rules Hong Kong: German automakers would like the city of Hong Kong to allow plug-in hybrid electric vehicles in its EV sales numbers, and to change incentives that only all-electric vehicles get to have. For now, only all-electric vehicles are counted, which has helped Tesla Motors gain 80 percent share of that market. Plug-in hybrids aren’t allowed to tap into the 100% waiver on first-registration taxes, which all-electric vehicles are granted. Those numbers can be pretty steep in the market, allowing for a price advantage all-electric vehicles get to enjoy. Electrifying trucks: Electrification of medium- and heavy-duty trucks can be one of the best moves fleets and transportation companies can make for cost reduction, even during this time of stable gasoline and diesel prices. Roger Bedell, former CEO and founder of Opbrid Fast Charge, a company that provides high-power bus-charging stations, did a cost analysis for Trucks.com. “The key is to look for situations in which fuel usage is the highest — for example, running big rigs at highway speeds for long distances. Although giant trucks are far from the easiest vehicles to electrify, they have the most potential profit possibilities for electrification,” according to Bedell. California HOV stickers: California took no action last week on Assembly Bill 1964, which would extend the driving perk beyond 2019 or allow more green stickers above the currently capped 85,000 limit. Legislators don’t know if the bill will be reintroduced in the next legislative session. There are now 6,500 drivers on a waiting list for the green decals. Plug In America has been opposing AB 1964, that supported plug-in hybrid green stickers but limited purchase incentives on battery electric vehicles. Why are Uber and competitors trying out electrified vehicles? Uber just made an announcement that it’s bringing in more than 50 electric cars (with the first 20 being Nissan Leafs) to its fleet in London as a test project. It’s being carried out to examine the feasibility of running large numbers of electric private hire vehicles in the UK, according to Energy Savings Trust, which is conducting the study. The ride-hailing company says that 60% of Uber trips in London are being made in hybrids. Uber says it is bringing in electric cars to tackle air pollution in London, a city that has been working on reducing its traffic congestion and smog. Hybrids and electric cars have been visible for Uber in other applications for years. 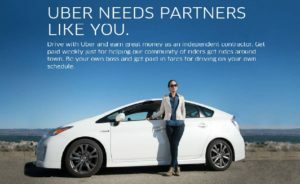 If you look at the Uber Partner website, you’ll see a young woman driver leaning up against her Toyota Prius (see above). The partnership announced in August between Uber and Volvo will be carried out in 100 Volvo XC90 plug-in hybrids by the end of the year. Uber will outfit the cars with autonomous driving technology it has developed in house. These will be tested as part of Uber’s autonomous vehicle testing project in Pittsburgh. General Motors and Lyft will begin testing a fleet of self-driving Chevy Bolt electric taxis on public roads by next May. Customers will have the opportunity to opt in or out of the pilot when hailing a Lyft car from the company’s mobile app, according to Lyft. In May, Google agreed to buy 100 Chrysler Pacifica plug-in hybrid minivans from Fiat Chrysler Automobiles to expand its self-driving vehicle testing program. As for now these vehicles won’t be offered for sale to the public; Google will work with FCA directly on testing the vehicles. Testing the economics: These cars are owned by drivers, who need to see financial gains from driving for Uber and Lyft. Hybrids and plug-ins means spending less on fuel. These cars, especially all electric, tend to need very little in maintenance and repair compared to gasoline engine cars; and less than hybrids and plug-in hybrids. Drivers would be concerned that the all-electric vehicle’s range will need to be longer than 200 miles, as they’ll easily put that many miles on the car driving on a Friday or Saturday night. Hybrids, plug-in hybrids, and fuel-efficient small gasoline-engine cars would make more sense for now. Range is getting better: All-electric cars have been getting better in the past couple of years, which would make the BMW i3, Nissan Leaf, Ford Focus Electric, and other models, more appealing. For some drivers taking short city trips for two-to-four hour increments, it’s not just about waiting for the 200-300 miles per charge cars to roll out in the next couple of years. Plug-in hybrids are doing better, too, with more miles coming through the battery in the revamped Chevy Volt and other models. Hybrids themselves can do pretty well, especially the Prius. Mine can go about 475 miles on a tank of gas and get about 48 mpg. Sustainability concerns: Lots of consumers using Uber and Lyft, and car shoppers, are looking for clean cars that run on zero emissions, or near zero. It might be even more important than saving money on transportation. I’ve had a few riders tell me they love Uber and Lyft because they’ll be taking cars off roads as more rides are shared; and if you ride in a hybrid or plug-in, that’s less that you’re emitting in greenhouse gases and air pollution. It could be a good marketing angle for Uber and Lyft. Environmentally conscious riders would likely pay a little more for a ride in a green car than a gasoline-powered car. Trying out the new technology: Interested in buying/leasing a Tesla Model S, Nissan Leaf, BMW i3, Toyota Prius Prime, or Chevy Volt? You can try renting one at Enterprise or elsewhere, but there aren’t many of these vehicles available. Taking an Uber or Lyft ride allows you to take a trip and ask the driver a lot of questions on what’s it’s like to own the car. The drivers will share their experiences with hybrid and electric cars – straightforward conversation is part of the experience drivers and riders enjoy from Uber and Lyft. If that driver has owned one of these cars for a couple of years, questions will be asked. Several riders have asked me to explain how the Prius dashboard works, what I think of the car, and what kind of mileage it gets. Is it worth owning, they wonder. Ties in well with self-driving cars: Autonomous vehicles are ideal for charging the electric vehicles most efficiently, such as during off-peak hours, said Tim Lipman, Co-Director at the Transportation Sustainability Research Center, UC Berkeley, during a speaker panel last year. Electric vehicles are easier to control and maintain than traditional internal combustion engine vehicles. 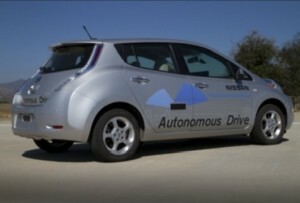 Electric autonomous vehicles would be ideal for meeting energy efficiency and environmental targets in a fleet, he said. I would say that the future of city transportation will be shaped by electrified, autonomous vehicles tied into mobility services like Uber and Lyft. Ridesharing, carpooling, carsharing…… lots of sharing and less car ownership. Google Vs. Uber: As covered in the top 10 news stories for this week, since May, Google has been testing out a carpool service in San Francisco using the Waze navigation mobile app. Google plans to roll out a carpooling service that will compete directly with Uber and Lyft. While Google has invested $258 million in Uber, there’s been a visible split between the two companies lately; for one thing, they’re both investing in playing a leading role in self-driving vehicles. My book Tales of UberMan is a bit dated on that issue, especially in the chapter called, “Will Google and Uber launch a driverless ridesharing company called gUber?” They did seem to have an alliance, but that’s changed in recent months. Both of these companies see the future of mobility tied into electrified and self-driving vehicles. They’re not alone. “The two most profound innovations in automotive since the moving production line are electrification and autonomy,” Tesla CEO Elon Musk said earlier this year to Automotive News. Electrified transportation is explored in my book Tales of UberMan: An auto journalist shares his Prius with savvy riders.